Zion Market Research has published a new report titled “Orthodontic Retainers Market by Product Type (Metal, Ceramics, Polymer Material, and Others) and by End-User (Adult, Teen, and Kids): Global Industry Perspective, Comprehensive Analysis, and Forecast, 2017 – 2024”. 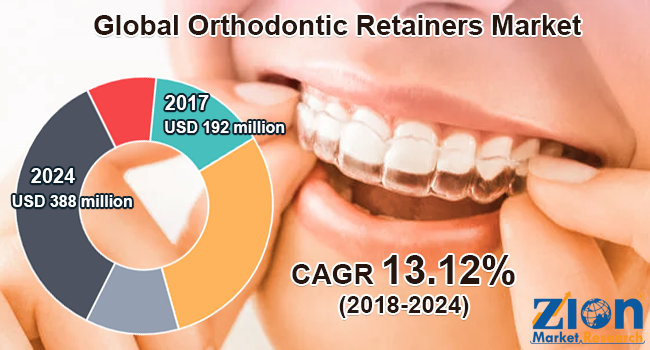 According to the report, the global orthodontic retainer market accounted for USD 192 million in 2017 and is expected to reach approximately USD 388 million by 2024, growing at a CAGR of around 13.12% between 2018 and 2024. Orthodontic treatment is performed with multiple devices, such as braces, helps in fixing dental problems. However, wearing retainers even after treatment helps in maintaining teeth in proper alignment. Wearing retainers is equally important when compared to the treatment itself. There are two types of retainers available in the market—fixed and removable. Dentists prescribe retainers depending on the condition of the patient and the type of orthodontic retainers required to fix their teeth. The global orthodontic retainers market is expected to witness an excellent rate of growth in the forecast time period, due to the increasing number of dentists across the world. Awareness about dental care across the world is also considered as one of the major drivers for the global orthodontic retainers market. In addition, the expansion of the cosmetics industry is also responsible for the development of orthodontic retainers market. However, the high product cost and unfavorable reimbursement policies might hinder the orthodontic retainers market. Nonetheless, innovation and development in the field of dentistry might create growth opportunities in the market in the forecast time period. By product type, the orthodontic retainers market is segmented into metal, ceramics, a polymer material, and others. Metal orthodontic retainers are one of the commonly used product types and are likely to contribute approximately over 35% in the orthodontic retainers market followed by the polymer material. The growth of metal orthodontic retainers can be attributed to their low cost and dentists’ preference for these products. Based on end-user, the orthodontic retainers market is classified into adult, teens, and kids. Teens formed the major consumers of orthodontic retainers in the year 2017, owing to lifestyle changes and high per capita income along with the rise in the healthcare expenditure witnessed in developed countries, such as the U.S., Germany, France, etc. Based on region, the global orthodontic retainers market is segmented into North America, Europe, Asia Pacific, Latin America, and the Middle East and Africa. North America was the largest market in terms of revenue and held approximately more than 38% of the market share in the year 2017. Immense industrial growth witnessed in the Asia Pacific is likely to prompt the regional expansion of the orthodontic retainers market in the upcoming years. Some of the key participants operating in the global orthodontic retainers market include DENLAB, Protec Dental, Ormco, Dentsply, 3M Unitek, and Henry Schein, among others.